Stage Design: Accepting applications annually. Directing: Accepting applications for Fall 2017, 2020. For financial consideration: March 10 for Fall. The Master of Fine Arts in theatre arts is a three-year program offering two areas of emphasis: design/stage technology and directing. 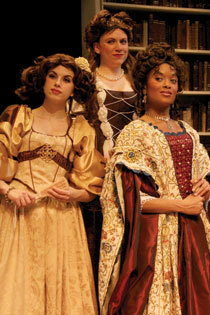 All graduate programs combine academic depth with professional training to prepare students for success in theatre. Students admitted to the program are selected through University/Resident Theatre Association (URTA) auditions and through on-campus interview and portfolio presentation. Students interested in the design/technical emphasis should be able to provide evidence of drawing ability and/or technical skills. Graduate courses are offered in the disciplines of dramatic analysis, theatre history, directing, film, production, and design. Theatre classes and productions are held in the Temple Building, which contains the Howell Theatre, Studio Theatre, and Lab Theatre. Teaching assistantships are available for selected students. For additional details check out the dept./program website: Theatre Arts.